Rachel Carson needs almost no introduction for many, especially in the environmental movement. The biologist who authored, among others, the seminal book, “Silent Spring,” about widespread and largely untested use of chemicals and pesticides—specifically DDT—and their detrimental impacts on wildlife and people. Carson even has a bridge named in her honor in Pittsburgh. But there hasn’t been a documentary made about her life and work since 1963. 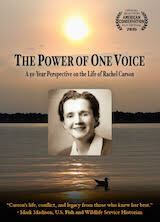 That is until now--“The Power of One Voice: A 50-Year Perspective on the Life of Rachel Carson." The 50th anniversary of Rachel Carson’s book “Silent Spring” was celebrated in 2012, at a symposium in Pittsburgh at Chatham University. The film is composed of interviews from participants at that event. Director Mark Dixon says he wanted to take advantage of this gathering of Carson experts, including her biologist Linda Lear. In one of the first scenes of the film, Carson's adopted son Roger Christie talks about her devotion to her family, and to her work. "So often people think of Carson as 'the pesticide lady,' I think Roger even says just about those words," Dixon says. "And I really wanted to smash that notion of--that that was the sole essence of her life. Because she was so human, in so many ways, that I think is really lost to history. And I think that once you get to know someone as a real human being, you can then begin to really understand their story, and relate to it yourself." Carson's story began in Springdale, Pa., the youngest child of a protective mother. Patty DeMarco, the film's executive producer and Carson scholar says her upbringing, which included exploring the woods and farmland around her home, impacted her later work as a scientist and writer. "I think what it did was give her a very deep grounding in the value of the natural world," DeMarco says. She says the animals Carson encountered in her adventures were her friends, and she came to view herself as part of the natural world, and not a person in charge of the nature. Carson became a biologist at a time when women were rare in the scientific professions and biology was not a respected field. Instead chemistry and physics had helped win World War II and created a market for the "better life through chemistry" model. This helped usher in the era of chemical pesticides in agriculture, which Carson cautioned against. Yet Carson's work was influential. She was a celebrity, and spoke before Congress about the impacts of the chemical DDT on wildlife. The title of her book, "Silent Spring" refers to an imagined future where song birds would decline and no longer sing because of unrestricted use of toxic chemicals. DeMarco says Carson's message resonated with lawmakers and the public because she had unlocked the imaginations of many readers with her previous book, "The Sea Around Us," in 1951. Many soldiers during World War II had come into contact with the ocean as part of their service. The vast size and depth of the water was a mystery to a public who hadn't yet seen the documentaries of Jacques Cousteau. "Her book opened that window," Demarco says. The public loved her, so when she talked about the more difficult topics of pesticides and environmental hazards, they were primed to listen. Mark Dixon says she combined the best of biology and writing. Her book, "Silent Spring," he says, "changed the landscape for how we think about our relationship to the planet, to the natural systems. She encouraged us to think about the whole system, not just specific pointed impacts. And that awakening in the United States led to such transformative change and legislation that crossed political boundaries and has had impact for generations." Film cover image courtesy of Mark Dixon.